Artist Deborah Aschheim, who recently had an exhibition of her work at the Edward Cella Gallery sparked this post this morning. (See my review The Kindred Spirits of Deborah Aschheim and Richard Bradshaw: Nostalgia for the Future: Deborah Aschheim at the Edward Cella Gallery for much on the Bradshaw-Asscheim similarities). In a Happy New Year e-mail message to Deborah yesterday I asked what she she's been up to. It turns out that she will soon be visiting artist at the University of Nebraska- Lincoln. After her stint there she will travel to Bartlesville and Tulsa, Oklahoma and explore Frank Lloyd Wright and Bruce Goff projects and Welton Becket's Philips Petroleum Building. Then its on to Oklahoma City where she will get a personal tour from the wife of the Director of the Oklahoma City Museum of Art of much of the local work documented by Julius Shulman in last-years' one-man show, Julius Shulman: Oklahoma Modernism Rediscovered. (See at the end of this article a bibliography of Shulman's Oklahoma assignments I threw together to aid the curator). Not only does Bradshaw's work have much in common with Aschheim's, there are some striking similarities with Goff's work as well. The two images below are a good case in point. Thumbing through my Goff collection to see what materials might be of interest to Deborah for her trip I ran across the below Play Tower Goff designed for Sooner Park in Bartlesville, OK which instantly brought to mind a radar tower Richard Bradshaw designed a few years earlier. (See later below). 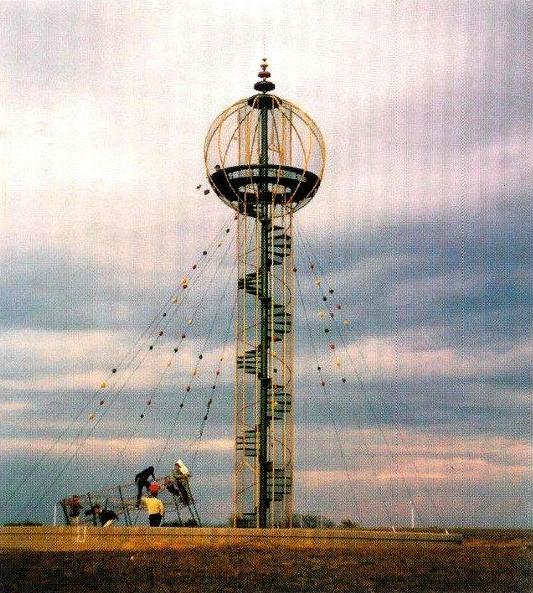 Bruce Goff, Play Tower, Sooner Park, Bartlesville, Oklahoma, 1963. (Bruce Goff Oklahoma Guide, Friends of Kebyar, Vol. 22.1, Issue No. 71, 2005-2006, p. 7). Mrs. Harold C. Price commissioned the tower in 1963. The Prices are, of course, Bartlesville's most well-known patrons of architecture. They sought out the best architects of the time. Bruce Goff was hired by Joe Price to design his home, Shin'enKan, and subsequent additions. Harold Price Sr., his father, had hired Cliff May to design the family home at Starview Farms, and at Goff's insistence hired Frank Lloyd Wright to design his only office building, the Price Tower. Harold Jr. hired Wright to design his home, "Hillside", essentially creating an architectural theme park. The May-designed house deteriorated badly and was razed by developers. After the loss of Shin'enKan by arson in 1996, he only remaining Price family house is the Wright-designed "Hillside." Originally the above five-story metal-framed, mesh-enclosed spiral stair observation tower with a circular seat at the top, was placed in a circular sand play-pit that also had a Mobius continuous steel construction within it. The tower's condition deteriorated to the point that it was closed to the public in the early 1990s. Recent efforts to restore the tower are summarized in the following two articles from the Bartlesville Examiner-Enterprise. Radar Tower, Richard Bradshaw, structural Engineer, ca. 1960. Photo courtesy Richard Bradshaw. "Even though it is just a small structure it is also a large model to experiment with. I did this whenever I had the chance even though it cost me lots of money!" "These are in front of an aircraft plant. The owners wanted something looking a little better than the typical industrial look of Radar Towers. The vertical load is taken by the central pipe. The wind or earthquake loads are taken by the straight line cables of the hyperboloid. The force in the cables are the main load in the central pipe. The man on the tower at left gives an idea of scale. Note the spiral staircase." 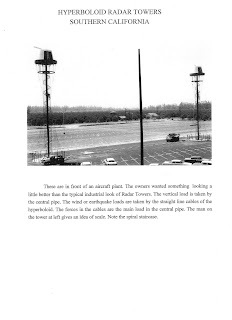 Hyperboloid Radar Towers, Southern California, from "The Non-Shell Structures of Richard R. Bradshaw, n.d., p. .
Bradshaw credits the success of the radar towers with giving him the courage to create the design for the enclosed, suspended stadium for Welton Becket & Associates seen below a few years later. Prototype enclosed suspended stadium. Richard Bradshaw, Structural Engineer for Welton Becket & Associates, unbuilt. (Total Design: Architecture of Welton Becket and Associates by William Dudley Hint, Jr., McGraw-Hill, 1972, p. 222. "This was a Stadium for the New Orleans Saints. Becket asked me to come up with an idea so this was it. 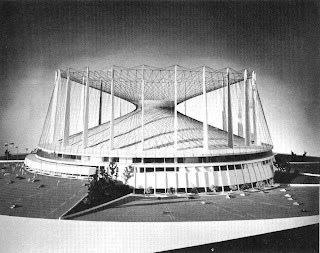 The geometry of the stadium is a Hyperboloid and the shape is formed by straight cables. This was quite new at the time. Becket did not get the design contract so the idea was never built. Incidentally, this is just a larger version of the radar tower I designed and which was built. This is a good example of how an engineer should capitalize on opportunities to experiment with small structures when he has a chance. If I had not already built a successful example of the cable architecture on the small tower I would never have had the confidence to commit myself to the solution for the big stadium." "[Goff] was always kind of an "Architects' Architect" meaning he never got the public recognition he deserved. I am sorry to say that I regard his tower as a lost opportunity. It has no use of geometry at all. For that matter it shows no understanding of structure either. It would have looked so much more logical if it had the tower made of a Hyperboloid (like mine) with the sphere at top firmly embraced by the Hyperboloid. Even without using the Hyperboloid but just the straight cylindrical tower. it would have made more sense to just make the cylinder take the forces on the tower and not put the horrible guy wires on it. ... The sphere is quite good but the everything else is just plain amateurish. Goff never was noted for his understanding of geometry or structure. He did good work but of small structures." It will be quite interesting to see how the Oklahoma work of Wright, Goff, Becket, Herb Greene and others documented by Shulman will inspire Deborah Aschheim's future creations. Deborah informed me that she will be speaking at the below event at the Cella Gallery on March 26th upon her return from the frigid Great Plains. Join artists Deborah Aschheim, George Legrady and Laurie Frick for an overview of selected recent projects which set the stage for an engaging dialog about the function of artistic inquiry within the cognitive sciences including the roles of personal experience, data collection, and research.